I am always moved by graduation ceremonies. They give us all a formal time to celebrate the enormous accomplishments of those we love. Yesterday, our nephew, Parker Cadwell, graduated from Middlebury College. 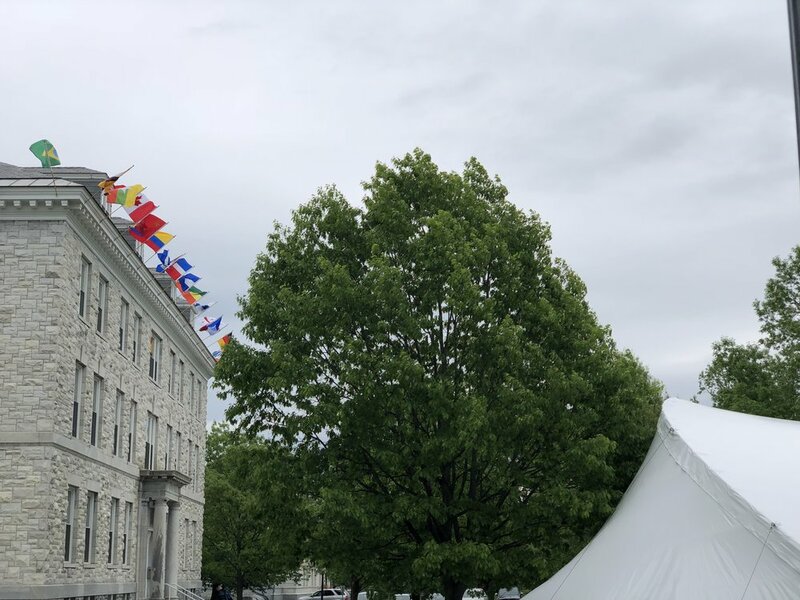 Middlebury holds a special place in our hearts because Ashley and I are both alumni, our son, Chris graduated in 2006, and countless other family members have walked these grounds and studied here since the late 1800s. Parker is the last Cadwell we may see graduate from our dear college at least for the foreseeable future. We were all there to celebrate him. Along with Parker, we cheered for the 531 other graduates from 55 countries. The graduation speaker was Isabel Wilkerson, author of The Warmth of Other Suns, the story of the great migration of African Americans from the south to points north over three decades. She is also a recipient of a Pulitzer Prize for Journalism. Reading The Warmth of Other Suns, I feel that I am living alongside the real people who experienced such horrific injustice for so long. The way that Isabel Wilkerson writes engenders empathy as it informs us of three African Americans' experiences and stories of seeking a better life. Ashley and I also listened to her interview with Krista Tippet on On Being, which we recommend. Here we are…gathered together, your shining faces, the robes, exams over, requirements met…at what will now be your alma mater. You are singularly connected to this historic moment of polarity and promise. You were studying and incubating into adulthood as the world changed or rather revealed itself to us. So today, in our fractious era, I am here to make the case for radical empathy. Radical empathy means putting in the work to learn and to listen with the heart wide open. To understand another’s experience well enough to know how they are feeling not as we imagine we would feel. Radical empathy is not about you and what you would do in a situation you have never been in and perhaps never will. It is the generosity of spirit that opens your heart to the true experience and pain and perspective of another. We need more of that in this world. If you love yourself and if you love humanity, if you have empathy, you cannot hurt another human being any more than you would want to feel that pain yourself. The work that goes into learning another person's reality opens up new ways of seeing the world, allows you to more accurately assess any situation that you happen to be in. Radical empathy is a super power that can heal and build bridges stronger than steel and concrete. The most important bridge that any of us will ever cross is the bridge to the human heart. At Middlebury, we have gained a multi-faceted view of the world, seeing beyond one perspective or viewpoint. We might not like it and we might not agree, but we have the tools to challenge opinions and engage in deliberative dialogue. We are transitioning into a world where harsh views and fake news seem the norm, where people are unashamed to spew hate. But now we have the tools to engage with this world, leaving it a little more truthful, a little more kind. Though the world is wildly unforgiving, we learned to be intellectually fearless in the face of adversity. We must press on with persistence and resilience… So, let’s keep learning, let’s keep progressing, let’s keep loving. Let’s keep pressing on. Onward, to all of the brand new graduates all over our country and all over the world, and to all of us. Radical Empathy, Perseverence, Resilience, Truth, Kindness. At this moment in time, we are called to bring all of these qualities into the world every day of our lives.